Greetings blog friends! I’m back with another tone on tone card and I’m sorry to do this, but I have an additional disclaimer to share about a technique that I tried yesterday. I sent my cut die still in the die back through the Grand Calibur to emboss and I don’t recommend you doing it. It leaves a faint line on the embossing folder and can mar the surface potentially showing on your paper on future embosses. It was just me experimenting and many have asked me how I preserved the edge, but now you’ve been cautioned and know it can mar your folder. Edited to add: my sweet friend Sue Wilson emailed me Whew . . . now with that behind me on to my card for today – a square, embossed card. My Get Well card was created using Spellbinders Grand Squares and embellished with sentiments from JustRite Papercrafts – Chicken Soup Labels Four. I embossed with Spellbinders Dainty Dots and created my card base using the technique I’ve shown you for Spellbinders Hinged Card Bases. If you’re interested in the same technique for Creating Plain Card Bases, I originally did this technique back in February 2011 and you can see my older video —>HERE. 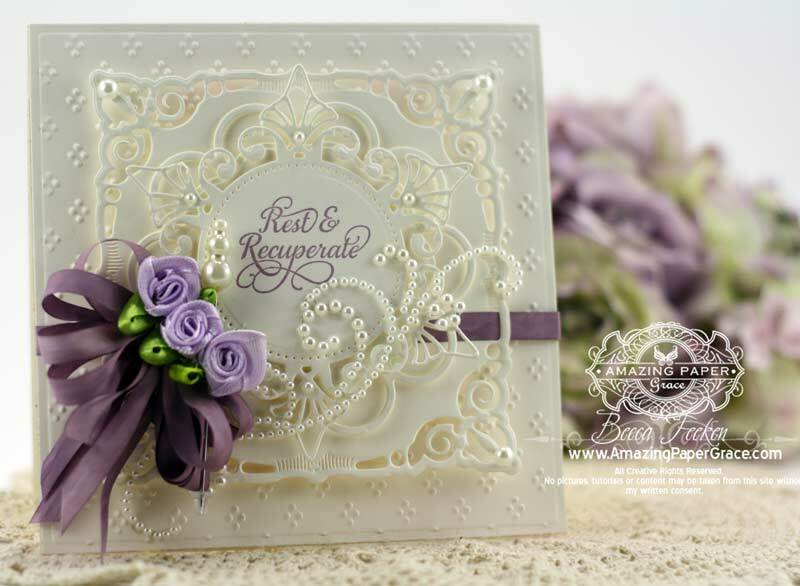 On top of this card base I added Spellbinders Adorning Squares, topped it with Spellbinders Blossom Tags and Accents, added Spellbinders Venetian Motifs and on the inside used Get Well Labels Twenty , embellishing with Spellbinders Venetian Accents. So to recap the layers from the bottom up, die cut layer of Grand Squares 5″ x 5″, foam tape, die cut layer ofAdorning Squares, foam tape, die cut layer of Blossom Tags, foam tape die cut layer of Venetian Motifs. Hugs friends, I’m tickled to be a part of your online journey. Everyday is finding me so inspired and I hope you are too! Oooh – more of this elegant creamy look! I just love it!! Say Becca, there is a way to do the embossing and maintain the margin on the die without ruining your embossing folder. You keep the folder open and use your rubber mat. I have to run off to work right now, but I’ll send you a link to that tutorial (it’s pinned on my Tutorial Paper board) when I get a chance later today. Love the tone on tone, Becca. Love the tutorials and EVERYTHING you do, girl!! An inspiration to all of us wanna-be card “Becca style” cardmakers. Wow…..so elegant….I just love that green in with the purple flowers and ribbon. And that Spellbinders Venetian die…another wow….just love it. The purple sentiment was a great idea for color also. I would be interested in seeing the tutorial from Chelsea who wrote the first comment. I love this process and would really like to see how you don’t leave the marks on the folders. Oh my goodness! An absolute stunner! Only one word for this card: stunning! I’d be willing to get sick just to receive this beauty! absolutely stunning……..love it!!! 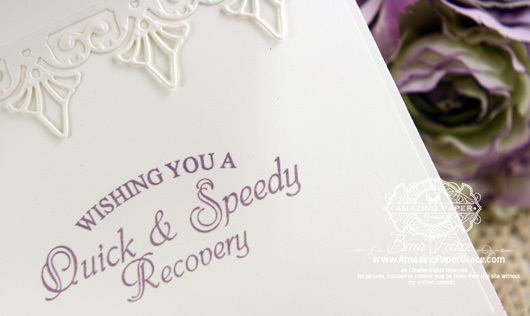 Also would love to receive this card, along with almost every card you’ve show cased here, lol!! OMG I laughed when I read Karen’s reply about being willing to get sick to receive it, lmbo, that’s a good one love it!! I was wondering about that when I saw that you embossed with the cut still in the die but figured I’d try it one day, if you do it it must be ok, lol ty for letting us know before I tried it, I’d be sick if one of my embossing folders got mared, my solution….by two….. LOL jk, a few ladies had a better idea, lol, much cheaper!! Your card and the colors are so very pretty. I love the lilac and green combination. Since the arrival of beautiful summer weather I try to spend much of my time outdoors in my garden so creating something like this, that is fairly quick to put together is appreciated. Thank you for sharing! Hi Becca. 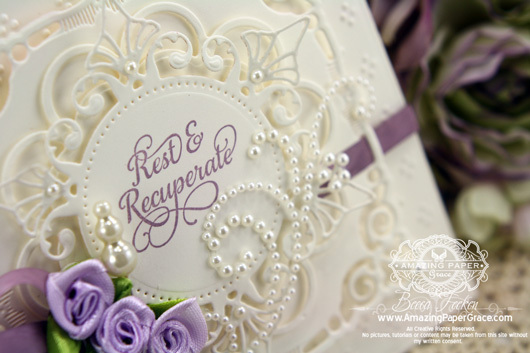 This card is stunning, the gorgeous embossing and die-cuts and the beautiful flowers all add to the beauty. If only you could hear my comments each day when I open your card!!! Oh my, oh my, oh my Beautiful, Breath taking, Gorgeous and the list does not end there!!! !